Archeologists are now working to remove small artifacts and map sections of the wreckage of the massive Confederate Ironclad CSS Georgia in Savannah Harbor prior to heavy lifting operations, expected to be completed by the end of this summer. Even so diving on the wreck will not be easy or safe. The ship was scuttled by the Confederates as Sherman’s Union forces marched on Savannah on the Georgia coast at the mouth of the Savannah River. The wreckage sat on the edge of the ship channel and has been struck by vessels and dredgers over the years. The protective covering of the upper structure, the casemates, were constructed of railroad iron. Over the years since its sinking, the wreck has become a tangled mess of iron and accumulated debris brought downriver by swift currents. “The current is abated by diving at slack tide only. 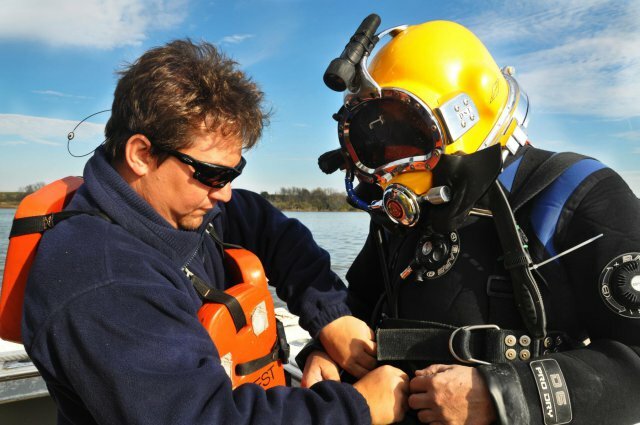 All the divers have extensive experience working in black water environments and work only under the supervision of the Corps’ dive inspector. Safety is the Corps’ top priority. No more than two divers will be in the water at once for safety reasons,” said Morgan. Once the divers have completed mapping, tagging and recovery operations, the US Navy will recover heavy materials. “The archaeological data recovery phase is expected to last until early summer 2015. Upon completion of that phase, the US Navy will set up on site to recover ordnance, large artifacts, the casemate sections and miscellaneous railroad iron using large mechanized machinery. A lift plan that details where cuts will be made, placement of straps and slings, and type of lift structure will be developed for each artifact and casemate section in the next couple of months, ” said Morgan. It is now believed that nothing of the hull of the Georgia remains. The massive upper works may have crushed the wooden hull beneath it. This, coupled with teredo worm damage in the salty estuarine water, may have resulted in the complete disintegration of the hull. Morgan states: “Studies conducted in the 1970s thought that the hull was buried underneath sediments. In the 1980s, it was thought to be underneath one of the casemate sections. In both instances, it was never seen, only THOUGHT to be there. Given the presence of heavy silting and the resulting anaerobic environment, it may be possible that some heavy timbers, such as live oak frames, or the very bottom strakes of the hull, have survived. Whether or not this is so remains to be seen. The Archaeology Hour asked Morgan about the disposition of any artifacts that might remain in the wreckage. According to Morgan there is no archival record of anything having been removed from the ironclad before it was scuttled. If the ship was abandoned in haste ahead of Sherman’s army, it may therefore contain artifacts. “The archaeologists are currently recovering small artifacts from the wreck site. No personal items have been found. It is unlikely that we will find anything else due to the lack of sediments and the current,” added Morgan. “The Corps has contracted with Conservation Research Laboratory at Texas A&M University to conserve the artifacts that will be retained for curation and exhibit. All of the large artifacts, i.e., cannons and power plant parts, as well as ordnance, casemate sections and other small artifacts with unique or diagnostic features will be conserved. There are no loan agreements in place at this time, but several museums of have expressed interest in exhibiting the artifacts. Final decisions regarding the disposition of the artifacts will be made by the US Navy as that agency is held accountable for CSS Georgia,” Morgan said. The entire property of the Confederate States of America, especially its fleets and weapons, became the property of the Federal Government following the defeat of the Confederacy. The Archaeology Hour hopes to broadcast an audio interview with Ms. Morgan in the coming weeks, followed a video segment later in the year.